Recent events have moved the line between Cheap Knock-Offs and Counterfeit goods. Last week, major UK supermarket chain Tesco was caught in the act of selling what turned out to be a bogus bottle of Louis Jadot Pouilly-Fuissé wine. 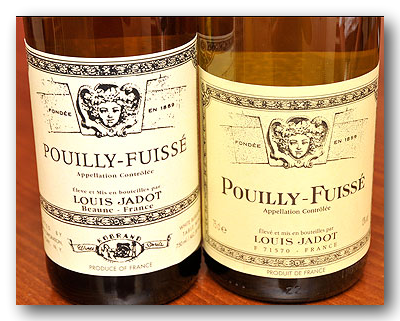 Danny McGowan bought two bottles of French Louis Jadot Pouilly-Fuisse wine, reduced from £14.49 to a bargain £5. He [noted] that the label “looked photocopied” and the bottles had a screw top instead of Louis Jadot’s usual cork. But when he opened them at home, he discovered the fine white wine was actually cheap plonk. C’mon Danny, what did you expect for your £5? While it’s estimated that 5% of the wine sold today is Counterfeit, most of the dubious stuff is up at the high end, where it’s worth everyone’s while to monkey with reality. The most famous example were the Jefferson bottles whose history was recounted in The Billionaire’s Vinegar which we reported on last year. Those babies went for north of $100,000 … each. Whoever produced the bogus Pouilly-Fuissé is giving the real hardworking counterfeiters a bad name. It’s a shame and embarrassing. They should have come up with their own cheap label for their own cheap wine. Producing a great Knock-Off instead of a crummy Counterfeit. They should Think Different, as a modern philosopher once said. And speaking of Thinking Different, how about this for a unique idea … Counterfeiting people. A union protesting the hiring of non-union workers is hiring non-union pickets to impersonate union strikers. The Mid-Atlantic Regional Council of Carpenters is seeking paid demonstrators to march and chant in its current picket line [pretending to be union workers] outside the McPherson Building, an office complex here where the council says work is being done with nonunion labor … [so] the union hires unemployed people at the minimum wage—$8.25 an hour—to walk picket lines. So would you say that the minimum-wage ‘strikers‘ are the cheap plonk compared to bona fide carpenters? This definitely makes great sense to me.